Decision Central is installed in a Red Hat JBoss EAP 7.2 server, as described in Installing and configuring Red Hat Decision Manager on Red Hat JBoss EAP. Decision Central users have been added to RH-SSO as described in Chapter 3, Adding Red Hat Decision Manager users. After the RH-SSO server starts, open http://localhost:8180/auth/admin in a web browser and log in using the admin credentials that you created while installing RH-SSO. When you login for the first time, you can set up the initial user on the new user registration form. 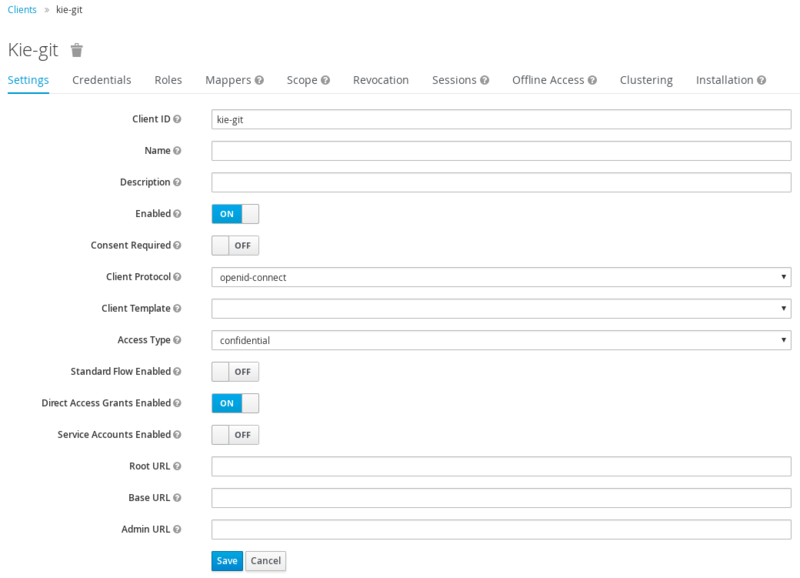 In the RH-SSO Admin Console, click the Realm Settings menu item. On the Realm Settings page, click Add Realm. The Add realm page opens. On the Add realm page, provide a name for the realm and click Create. Click the Clients menu item and click Create. After you create a new client, its Access Type is set to public by default. Change it to confidential. The RH-SSO server is now configured with a realm with a client for Decision Central applications and running and listening for HTTP connections at localhost:8180. This realm provides different users, roles, and sessions for Decision Central applications. After you install RH-SSO, you must install the RH-SSO client adapter for Red Hat JBoss EAP and configure it for Decision Central. Decision Central is installed in a Red Hat JBoss EAP 7.2 instance, as described in as described in Installing and configuring Red Hat Decision Manager on Red Hat JBoss EAP. A user with the admin role has been added to RH-SSO as described in Chapter 3, Adding Red Hat Decision Manager users. secure-deployment name is the name of your application’s WAR file. realm-public-key is the public key of the realm you created. You can find the key in the Keys tab in the Realm settings page of the realm you created in the RH-SSO Admin Console. If you do not provide a value for realm-public-key, the server retrieves it automatically. resource is the name for the client that you created. credential name is the secret key for the client you created. You can find the key in the Credentials tab on the Clients page of the RH-SSO Admin Console. The RH-SSO server converts the user names to lower case. Therefore, after integration with RH-SSO, your user name will appear in lower case in Red Hat Decision Manager. If you have user names in upper case hard coded in business processes, the application might not be able to identify the upper case user. You can also configure the RH-SSO adapter for Decision Central by updating your application’s WAR file to use the RH-SSO security subsystem. However, Red Hat recommends that you configure the adapter through the RH-SSO subsystem. Doing this updates the Red Hat JBoss EAP configuration instead of applying the configuration on each WAR file. Decision Central provides different remote service endpoints that can be consumed by third-party clients using a remote API. To authenticate those services through RH-SSO, you must disable the BasicAuthSecurityFilter parameter. To consume other remote services such as file systems (for example, a remote GIT service), you must specify the correct RH-SSO login module. Navigate to the RH-SSO Admin Console located at http://localhost:8180/auth/admin. Set Client ID as kie-git. Set Access Type as confidential. Disable the Standard Flow Enabled option. Enable the Direct Access Grants Enabled option. Click the Installation tab at the top of the client configuration screen and choose Keycloak OIDC JSON as a Format Option. Move the downloaded JSON file to an accessible directory in the server’s file system or add it to the application class path. The JSON file specified in the module-option element contains a client used for securing the remote services. Replace the $EAP_HOME/kie-git.json value of the module-option element with the absolute path or the class path (classpath:/EXAMPLE_PATH/kie-git.json) to this JSON configuration file. This section describes how you can configure Decision Central to manage users and groups stored in RH-SSO. If the WEB-INF/classes/security-management.properties file does not exist, create it.